Real-time monitoring of urban dynamics, which is widely unexplored, has recently received a lot of attention due to the fast rise of inexpensive pervasive sensor technologies. Following the comprehensive vision of a “digital skin for planet Earth” by Neil Gross (1999), it can be presumed that geo-sensor web deployments will experience a considerable boost within the coming years, as pervasive sensing has recently become feasible and affordable. This enriches knowledge about our environment with uncharted real-time information layers. This book focuses on pervasive sensing in urban environments, which poses very particular challenges – as well technical and technological ones, as socio-political and privacy-related ones. 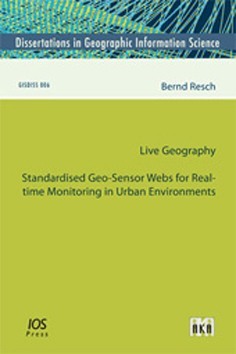 The Live Geography approach presented in this book seeks to tackle these challenges with an open sensing infrastructure for urban monitoring applications. The system makes extensive use of open (geospatial) standards throughout the entire process chain – from sensor fusion to data analysis, Complex Event Processing (CEP), alerting, and finally visualisation. The thesis discusses the implemented technical infrastructure as well as how the methodology can potentially influence the city and its inhabitants by “making the abstract real”. In other words, the thesis illustrates how pervasive monitoring infrastructures can change urban social interactions and people’s short-term behaviour, and which issues are related to establishing such systems.